Last weekend the Python Edinburgh users group hosted a mini-conference. Saturday morning was kicked off with a series of talks followed by sessions introducing and then focusing on contributing to django prior to sprints which really got going on the Sunday. The slides for my talk on, "Images and Vision in Python" are now available in pdf format here. The slide deck I used is relatively lightweight with my focus being on demonstrating using the different packages available. The code I went through is below. A little over two months ago I wrote about the first round of the AI cookbook competition. Since then there have been two further rounds and a considerable amount of further progress. For the latest round I was able to get the error score down to 10.867 using an additional image pre-processing step and then a variety of text clean-up improvements. Ian, who writes the AI Cookbook, had the theory that the curved text present at the top of many of the plaques in the test set were causing tesseract, our OCR software of choice, significant problems in transcribing the main text. If we could automatically recognise the curved text and block it out the transcription should be significantly improved. 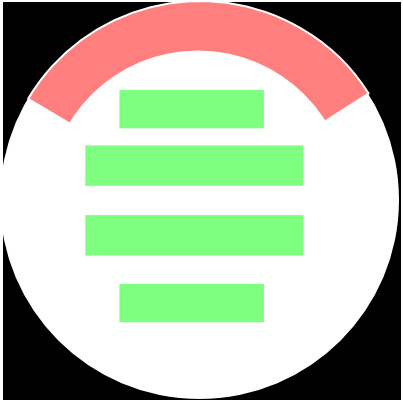 In the diagram below the text we want to be transcribed is in green and the text we don't want is in red. I couldn't think of a good method to actually recognise the curved text at the top so decided to use a 'dumb' approach. The curved text is in the same place on all the plaques so I built a system to apply the same mask to all the images. To do this I went back to what I could still remember from high school math lessons. To the probable delight of my old math teachers I quickly had some working code. The code I wrote cycles through all the pixels in the image and converts them to a distance and angle relative to the centre of the image. This process is hopefully easier to visualise in the image below. The distance is simple enough to calculate as we're dealing with a right-angle triangle; we simply square the x and y values, add them together and take the square root. The angle is a little trickier. 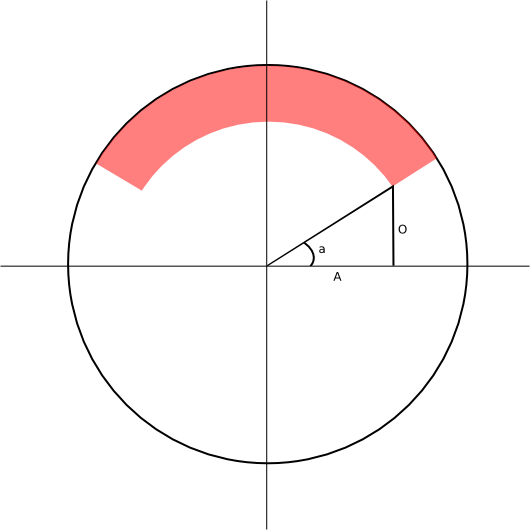 The y-value represents the opposite length of the triangle and the x-value represents the adjacent length so from the mnemonic SOH CAH TOA we known the angle will be tan-1 (O/A). Knowing that we can then apply our rules for distance and angle. Removed any words containing three of lowercase, uppercase, digits and punctuation. The regex for that last item is something of a monstrosity and as I'm far from an expert it wouldn't surprise me if it doesn't entirely do what I think it does. I've used whitespace to make it slightly easier to follow. Each line represents a sub-expression, if any sub-expression matches the string then the expression as a whole is considered to match. Each line matches a different combination of three from digits, lowercase, uppercase and punctuation. The .+ at the end means we match one or more of any character. The expressions in brackets starting with a question mark are look ahead assertions. The .+ still matches any character but the look ahead assertions state that at least one of the characters matched must be a digit for instance. It doesn't matter in what order the characters are present as long as they are present. If you suspect there is a flaw in the pattern or know some way to simplify it then I would really appreciate a quick note in the comments field below. That's all for now. I believe Ian is planning to run the competition for a further month and there are still considerable improvements to be made so it would be great to see more people taking part. 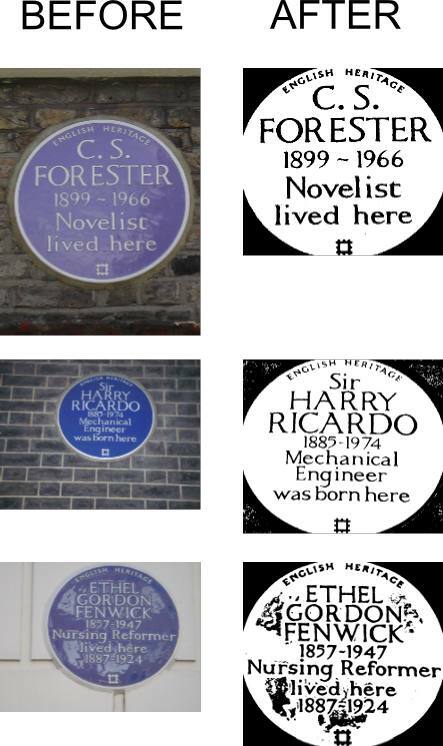 Ian Ozsvald over at aicookbook has been doing some work using optical character recognition (OCR) to transcribe plaques for the openplaques group. His write-ups have been interesting so when he posted a challenge to the community to improve on his demo code I decided to give it a try. The demo code was very much a proof of principle and its score of 709.3 was easy to beat. I managed to quickly get the score down to 44 and with a little more work reached 33.4. The score is a Levenshtein distance metric so the lower the better. I was hoping to get below 30 but in the end just didn't have time. I suspect it wouldn't take a lot of work to improve on my score. Here's what I've done so far . . . I'll post the entire script at the bottom of this post but want to highlight a few of the key elements first. The first stage of cropping the image on the plaque is handled by the function crop_to_plaque which expects a python image library image object. The function then reduces the size of the image to speed up processing before looking for blue pixels. A blue pixel is assumed to be any pixel where the value of the blue channel is 20% higher than both the red and green channels. The number of blue pixels in each row and column of the image is counted and then the image is cropped down to the rows and columns where the number of blue pixels is greater than 15% of the height and width of the image. This value is based solely on experimentation and seemed to give good results for this selection of plaques. The next stage of converting the image to black and white is handled by the function convert_to_bandl which again expects a python image library image object. The function converts any blue pixels to white and all other pixels to black. Ian has pointed out that this approach might be overly stringent and I might get better results using some grey as well. The result of running these two functions on three of the plaques is shown below. The next step was limiting the character set used by tesseract. The easiest way to do this is to create a file in /usr/share/tesseract-ocr/tessdata/configs/ which I called goodchars with the following content. Finally I perform a bunch of small clean up tasks. Firstly I fix the year ranges which frequently had extra spaces inserted and occasionally 1s appeared as i or l and 3 appeared as a parenthesis. These were fixed by a couple of regular expressions including one callback function (clean_years). Then I seperate the transcription out into individual words and fix a number of more issues including lone characters and duplicated characters before checking the spelling on any words of more than two characters. There is still lots of 'low hanging fruit' on this problem. At the moment the curved text at the top of the plaque and the small symbol at the bottom of the plaques is handled badly and I think the bad characters at the beginning and end of the transcriptions could be easily stripped out. The spelling corrections I make do overall reduce the error but they introduce some new errors. I suspect by being more selective in where spelling checks are made some of these introduced errors could be removed. """build plaques structure from CSV file"""